Adapted from the renowned novel by Shusaku Endo, Masahiro Shinoda’s 1971 film Silence (Chinmoku, co-written with Endo) explores the violent cultural conflict amid the arrival of Jesuit missionaries in seventeenth-century Japan. Shinoda’s excellent direction — coupled with a pensive score by the legendary Toru Takemitsu — gives cinematic expression to inner spiritual paradox, and imbues with religious mystery a landscape that seems already sentient with wind, rain, and light. By way of a heavily made-up and polyglot Tetsuro Tanba (Assassination, Kwaidan, Samurai Spy), Silence builds toward a revelation that approaches the impact of Colonel Kurtz’s entrance in Conrad’s Heart of Darkness (or Marlon Brando’s take on Kurtz in Coppola’s Apocalypse Now). Rendered in a tender colour palette courtesy of master cinematographer Kazuo Miyagawa (Rashomon, Yojimbo, Ugetsu monogatari), Silence unearths lies and beauty at the intersection of religion and Japanese society. 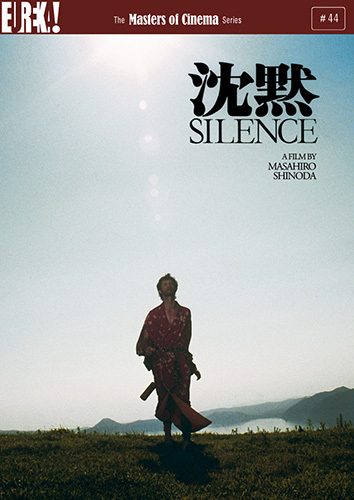 The Masters of Cinema Series is proud to present for the first time on DVD in the UK Masahiro Shinoda’s Silence — based upon the same novel that has intrigued American filmmaker Martin Scorsese for decades, and spurred his own work on a film adaptation of the source material.